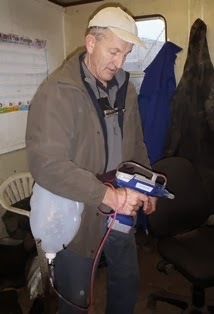 An electrically powered vaccinator from the US is saving pig producer Ian Thompson a lot of time – up to 50%, he says. It was during our study tour to Pork Expo in Iowa last year, sponsored by Elanco, that Ian discovered this unique time-saving equipment. Ian said: “The trip was very worthwhile and I’m grateful to Elanco and BPEX for giving me the opportunity to look further afield and find out about this new technology. Click here to read more on p3 of BPEX’s March issue of Pink Pages. Please get in touch with me if you'd like to know more about the vaccinator or about BPEX study tours.